If you’ve ever needed to quickly quit out of all open applications in Mac OS X, you’ve probably just resorted to flipping through every open application in the Dock, then hitting Command+Q, then repeating until everything is closed. But there’s a better way, and with an extraordinarily simple Automator app you can create a function that will instantly quit all apps, leaving you with nothing open on the Mac. Going further, you can toss that little crafted app into the Dock of a Mac and you’ll instantly be able to quit everything at anytime just by launching your little Quit All app, leaving you with a nice clean slate. 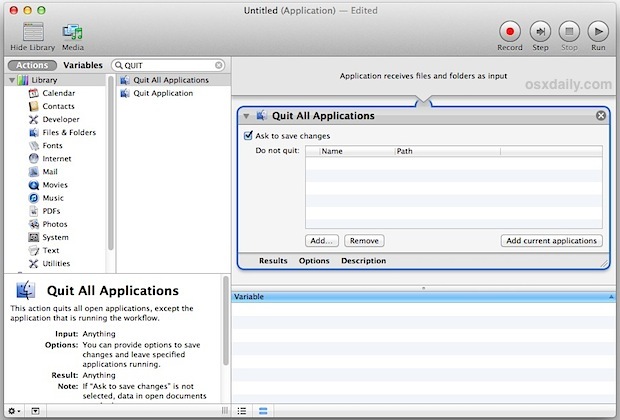 This tutorial will show you how to create a Quit All Applications app in Mac OS, and how to use it for exactly the described purpose. Making a little quit-all app is what we’ll cover here, it only takes a moment to setup. We’ll split this into two steps, creating the little quit-all app, and then using it to quit all apps. We’ll also cover some additional steps for customizing the icon, placing it in Dock, and some other tips which are optional but nice to know. Once saved, you’ll now have a little application that does nothing but quit all other open apps. It’s instant, it doesn’t pass through Automator or anything else, and functions as a self-contained app that is extremely quick, here’s what it should look like by default. Now that you have created the Automator app for quitting all apps, using it is a piece of cake. Just double-click the app to open it, causing all applications (including itself) to instantly quit. That’s it, just opening the app will quit all other Mac apps. The default Automator generated icon isn’t too descriptive if you’re going to have it resting in the MacOS X Dock, so if you feel like giving it a custom icon you’re free to use the icon below, it was crafted in about two seconds with Preview as a transparent PNG. It should look decent in the Mac OS X Dock, though it’s 256×256 resolution makes it impractical for large docks on retina displays. If you want to use that icon for your quit-all app, just save it to your desktop or copy it to your clipboard, then select your ‘Quit Everything’ app in the Finder, click that icon, and paste it over it. Simple, now it looks more stylish and it’s a bit more obvious what it’s purpose is. Launching the “Quit Everything” app does exactly what you’d expect, and it does not prompt to save changes if you have auto-save and window restore enabled, both of which are on by default in Mac OS X. Those two features should be left on as a data safeguard anyway, and they contribute to why this particular trick works so quickly, since it relies on window restoration to relaunch apps where they were left off. If you’d rather not have an app or Dock icon, you could save the Automator action as a workflow or service instead, and then have it be accessible through a unique keyboard shortcut by adding one under the “Keyboard” system preferences. If you go that route, be sure to pick a keystroke combination that doesn’t conflict with existing system keystrokes. Great tip. Since upgrading to Mavericks I can no longer see which applications are open by looking at the dock – which I keep on the left side of the screen. With the previous version of the OS I could at least see at a glance which applications were open. This is probably better anyway since I don’t need to quit apps one by one. Still, for all day usage I wish I could easily see which apps are open. The tiny white line on the light gray background is just too hard to see – even with my glasses on. Using this Automator App. doesn’t quit all app’s. Random, always 1 App did not quit, so……….??????? I’ve tried building this application several times, but cannot get it to work on my new Mac Air. I am a new Mac user (just got the Mac Air for Christmas), so that may explain it, but did the writer leave any steps out assuming everyone would know what they are? Does not appear to close all background apps. Charles, it works perfect and exactly as described. You did something wrong. Read the instructions and try again. Thanks for this. I added an “Ask for Confirmation” step first. This way, if I click on the application by accident, I can cancel out. Thank you for the great tip, I created [close all applications] app using Automator and have the app icon in the dock. The app apparently will quit all open apps only if the finder is the active app, otherwise it will leave any app open if it is in active window. So before running the app you must make sure that the finder is foremost. Is there an ARD command to make the finder the active app? Yes, this procedure doesn’t always work on some apps if the windows are still open. The only way to do this is to add a few more steps to the automator apart from the workflow. To do this, you’ll need to sandwich the Quit All Applications item in between two applescript sequences. The first tells Finder to activate. Only when the Finder window is above other application window will the Quit All Applications command work. After that the second applescript sequence tells Finder to close every open Finder window. Just like all other “help” articles you assume that the reader knows how to use automator. 1st of all automator app is not in application/utilities but utilities. the quit autiomator is not where you said – I had to search, and when I moved it to the right side there was no way to save as – just save but I had no option to make it an app or decide where to save it. You should buy an iPad, it would work well for you. Nothing about Automator is on the iPad. Very helpful coming from Windows. I was leaving everything open had no idea. In my reply to Joel Carlin’s post, I left some cryptic remarks about the advice given by this article not working entirely. It is true, the Quit All Applications action will oftentimes not work on applications that have a window open the desktop. The application needs to be more elaborate. Here are the steps. First, follow the instructions on this article to run Automator and to create a new Automator application. This will get Finder to make the Finder window the window that is on focus, opening a new window if none is open at that point. Third, follow the instructions on this article to add the second step in this workflow, which is to Quit All Applications. That’s it. Save the application as suggested in the article and you’re all set to go.